ANKARA, Turkey — Turkey’s president on Wednesday vowed to expand its operation against Kurdish forces in northern Syria toward the town of Manbij, which would bring Turkish troops and their Syrian allies closer to U.S. forces supporting the Kurds against the Islamic State group. A senior U.S. official said Washington is concerned that Turkey’s military offensive against the Afrin enclave could distract from the fight against IS and be exploited by extremists to re-supply or create safe havens. The official told a handful of reporters in Ankara on Wednesday that the Syrian Kurdish fighters in Afrin are not part of the Kurdish-led Syrian Democratic Forces, which drove IS from much of northeastern Syria with the help of the U.S.-led coalition. Regarding threats to expand the offensive to Manbij, the official said Washington’s “No. 1 concern is the safety and security of troops in the vicinity.” U.S. forces are based in Kurdish-held parts of northeastern Syria, including near Manbij, but not in or near Afrin. Turkey launched an incursion Saturday against Afrin, which is controlled by a Kurdish militia known as the People’s Defense Units, or YPG. Ankara views the YPG as an extension of the Kurdish insurgency in Turkey. The YPG forms the backbone of the Syrian Democratic Forces. Whose drones did the Russian military capture in Syria? The Russian Defense Ministry had referred to the "strange coincidence" of a US military intelligence plane allegedly barraging over the Mediterranean near the Russian bases when the drone attack took place. Any move toward Manbij would bring NATO member Turkey and its Syrian allies closer to U.S. forces, threatening friction. The U.S. has urged Turkey to exercise restraint. Kurdish forces captured Manbij, which is west of the Euphrates River, from IS in 2016 with the help of the U.S.-led coalition. Turkey has long demanded that the Kurdish fighters withdraw to the eastern bank of the river, and U.S. forces have patrolled the area to reduce tensions. The head of the Kurdish-controlled Manbij military council, Shervan Darwish, said his forces are prepared for a potential Turkish advance. He said the U.S. helped Kurdish fighters to liberate Manbij and has promised to keep defending it. 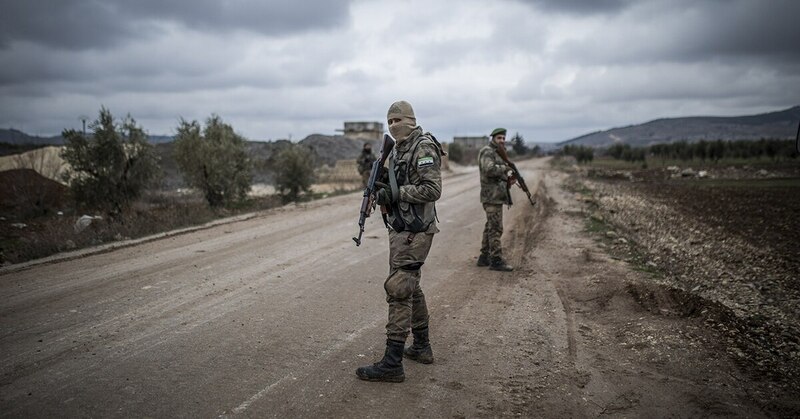 The advancing Turkish troops are facing stiff resistance in Afrin. Activists and Kurdish officials say airstrikes are still raining down on several parts of the district, which borders Turkey. On Wednesday, Kurdish officials said airstrikes hit in the vicinity of the Nissan 17 Dam, which provides power and water to the area, without damaging it. Would Germany be able to export as many weapons as it does if it scrutinized its customers closely? The Syrian Observatory for Human Rights, a Britain-based group that monitors the civil war, reported airstrikes in nearly 20 villages. The YPG said it infiltrated behind Turkish lines east of Afrin and targeted their bases. The United Nations says an estimated 5,000 people have been displaced inside the encircled enclave, and that Kurdish forces are not allowing civilians to leave. Erdogan said Turkish troops and allied fighters have killed at least 268 Syrian Kurdish fighters since the operation began. He said Turkish troops have suffered seven or eight losses. Turkey says it wants to create a 30 kilometer (20-mile) deep “secure zone” in Afrin. Erdogan said the operation would allow Syrian refugees to return home. Turkey is home to more than 3.4 million Syrian refugees. At least 27 civilians have been killed in the fighting in Afrin, mainly in Turkish airstrikes, according to the Syrian Observatory for Human Rights, a Britain-based group that monitors the civil war. U.S. Defense Secretary Jim Mattis said Tuesday that the fighting “disrupts what was a relatively stable area of Syria” and “distracts from the international efforts to ensure the defeat of ISIS,” using another acronym for the extremist group. Addressing Turkish complaints that the United States has not kept to its promises to take back weapons supplied to the Syrian Kurdish fighters, the U.S. official in Ankara said Washington intended to “fulfil the commitment,” without providing a time frame. 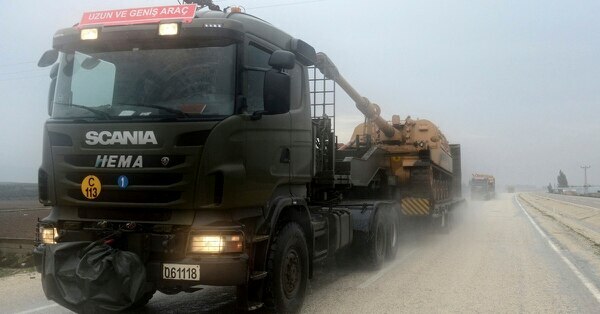 A second U.S. official denied Turkish government claims the U.S. had delivered thousands of trucks of weapons to the Syrian Kurdish forces, saying the bulk of the supplies went to U.S. forces and also included ammunition, food and humanitarian supplies. Both officials spoke on condition of anonymity because they were not authorized to talk to the media. IS has been driven from nearly all the territory it once controlled in Syria and neighboring Iraq, but the extremist group has proven resilient after past defeats, and is still launching insurgent-style attacks. The United States and 28 other countries are launching a new plan to better identify and punish anyone who uses chemical weapons, amid reports of a suspected gas attack in rebel-held suburbs of Damascus earlier this week. In an interview with the Interfax news agency, Russia’s Deputy Foreign Minister Sergei Ryabkov accused the U.S. of promoting “rigged, unverified reports” to hamper Russian peace efforts. Russia is hosting peace talks in the Black Sea resort of Sochi next week that some Syrian opposition figures said will run counter to U.N. peace initiatives. The U.S. and Russia reached an agreement in 2013 to remove all chemical weapons from Syria, but there have been several reported chemical attacks since then, including one last year that led President Donald Trump to order a retaliatory missile attack on a Syrian air base. Vasilyeva reported from Moscow. Associated Press writer Sarah El Deeb in Beirut contributed to this report.